Joseph Barbera reigned as one of the princes of American animation. As a young man, Barbera demonstrated an incredible propensity for artistry. Barbera started his career as a banker, and simply enjoyed doodling in his spare time. Every now and then he would submit his drawings to magazines, constantly receiving rejection letters until Collier's Magazine published one of his drawings and sent him a check. That was the beginning, and after a few more sales, it was obvious Barbera needed to change career paths. In MGM in the animation department, Barbera met another recent hire, William Hanna. The rest is history. The duo created their own animation company, Hanna-Barbera Productions. Barbera and his partner Hanna created some of the best-lived television programming of the 20th century and beyond. Won seven Academy Awards and eight Emmy Awards. 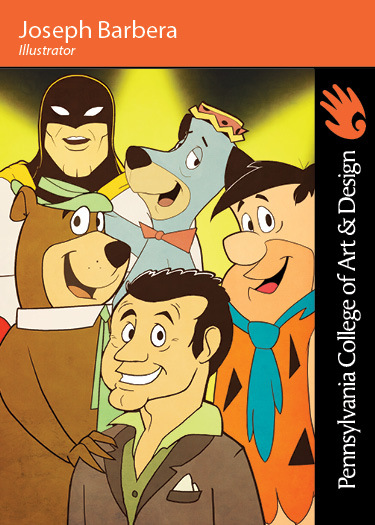 Co-founded Hanna-Barbera studios with Peter Hanna. He was the mastermind behind such iconic characters and shows such as The Flinstones, Yogi Bear, ScobbyDoo, Top Cat, The Smurfs, Huckleberry Hound, and the Jetsons. Worked with over 2000 animated characters in his career. QUOTE: "That's what keeps me going: dreaming, inventing, then hoping and dreaming some more in order to keep dreaming."